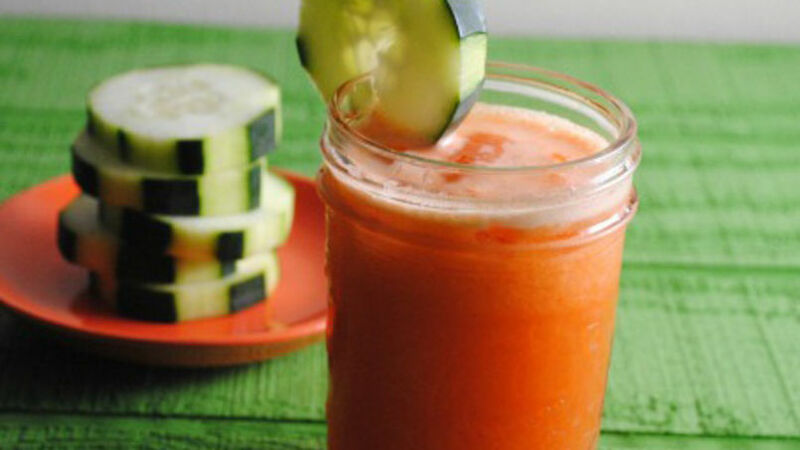 In a juicer or blender, add half the carrots, 2 cucumbers, salt, lime juice and 1 cup of water. Blend until smooth. Repeat with the remaining cucumbers and carrots, and water. Strain and add to a pitcher; sweeten to taste with sugar or agave. Finely dice the carrots for easier blending. I first had this agua when I was visiting my little brother in California. We had stopped to pick up a few items for dinner in a little mercado near his apartment. As we browsed the produce aisle looking for avocados, I spotted a row of brightly colored aguas being sold by the gallon. I asked the vendor which was her favorite and she quickly pointed to the vibrant orange agua made with carrots and cucumbers. I was hooked after one sip and have been recreating it at home ever since.